All stitching on our tipis is done with #92 industrial Dacron / Polyester threads that have been specifically manufactured to resist ultra-violet radiation. It will not rot and is much stronger than waxed cotton thread. Even though the thread is very strong there is no chance that it will tear the canvas when the tipi is stretched tight. 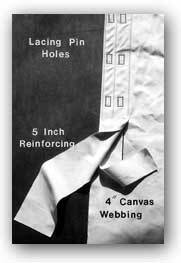 Because our canvas has such a dense, tightly woven finish, the needle holes and thread do not disrupt the canvas fiber at all – our seams positively will not leak. 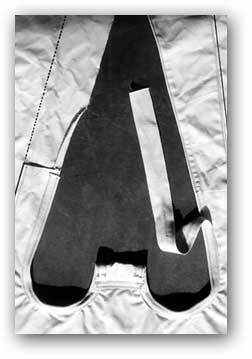 The zig-zag stitch was developed in the sail making industry as the strongest stitch possible to hold seams together in the torments of ocean weather, gale force winds and salt air. The zig-zag itself is an engineering geometry of triangles that distributes stress evenly and holds its internal tension. Our zig-zag stitching amounts to four rows of stitching but without the linear perforations of a straight stitch. The zig-zag stitch is combined with a straight stitch in our All Weather heavy weight fabric. The combination of zig-zag stitching and straight stitching is the strongest possible construction for our unique All Weather finishes. The Lacing Pin Holes run down the front of the tipi and are used with lacing pins to hold the tipi together. Living in the tipi we found that grommets buckle and often cut the tipi fabric, allowing rain to drip in. 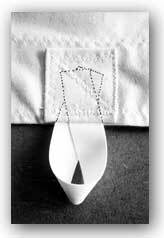 A “Button-holed” lacing pin hole fits snugly around the lacing pin and will not leak. All the lacing pin holes down the front of the tipi have 5″ of reinforcing around them. In addition to this, we insert a very heavy 4″ wide strip of webbing between the two layers of fabric. The lacing pin button-holes are then sewn on top of and completely through all these layers of reinforcement. They will not tear. The button-holes beneath the door hole have much more stress on them than any of the others. We sew two additional rectangular pieces of reinforcing (20″ x 20″) into the tipi just beneath the door hole. This strengthens this area against stress and tearing. It is also helpful to have this extra reinforcing at the bottom of the door hole where children and pets might catch a trailing foot as they enter the tipi. At the top of the lacing pin area the bottom of the smoke flap goes out at a 90 degree angle. This is a critical reinforcement area. Here we have 3″ nylon webbing sandwiched between these layers of canvas. Inside the layers of canvas reinforcing we have sewn in a 3/16 ” piece of braided nylon cord around the entire corner. This construction absolutely will not tear under even the most severe conditions. The Lift Pole Flap is the place where the tipi cover is attached to the tipi pole. The lift pole flap must be strong enough to support the cover while the tipi is being set-up. It is also the area that must withstand the pull of the smoke flaps – especially during high winds. We double reinforce our lift pole flap area with a large piece of canvas that extends all the way up to and underneath the smoke flap pockets. This entire area is then hemmed with a 3″ piece of extra heavy Type II canvas webbing. See photograph on the right. The dotted line on the left-hand side shows where the reinforcing piece will be sewn on as has already been done on the right-hand side of the photograph. You can also see the 3″ canvas webbing being hemmed around the entire area after the reinforcing has been sewn-on. This heavy webbing hem, combined with the gentle curve of the Blackfoot lift pole flap design, makes it virtually impossible for this area to weaken or tear. 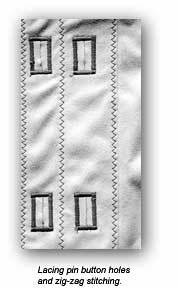 Our Smoke Flap Pockets ared double layered and have extra strength stitching (zigzag triangles) at all three corners. To prevent stretching and loss of original tipi shape, we sew a band of 2″ nylon webbing around the entire tipi, along the bottom edge. It is sewn on the inside of the tipi cover. The peg loops for staking the tipi to the ground are then sewn tightly to this 2″ nylon reinforcing band. The Peg Loop is 900 lb. test 3/4″ cotton webbing and is sewn-down with 5 rows of zig-zag stitching.